Whitworth has bestowed the Honorary Townsman title on nine individuals since 1980. The recipients have all been nominated for the award for their services to the Whitworth community. A Role of Honour can be found on display in the Council Chambers in the Whitworth Town Council offices at the Civic Hall (Riverside). 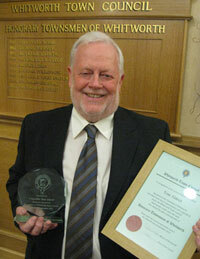 Pictured is Councillor Tom Aldred, the most recent recipient of the Honorary Townsman award.